I have done several searches without finding any papers addressing this question.. I'd like to know if there is any evidence to suggest that the strength of the simultaneous contrast illusion (or any similar effect) is affected by the length of time that a person looks at the display. For example, are people more likely to report a contrast effect / perceive the effect more strongly (as in perceive a bigger difference between targets) if they stare at the display for a few seconds as opposed to seeing a much more brief presentation of the display? Or vice versa? If you're aware of any literature or a good starting point for this, I'd be grateful if you can point me in the right direction. Equally, is there any literature addressing a similar question for different types of illusory effects? I'm still not 100% with this answer but this is what I've got: Research into time effect on illusion is sparce, but from what i have found I think it depends on the type of illusion. I found a paper by McCauley and Henrich which discusses the way in which illusions are processed - diachronic being over time and synchronic being instantly. 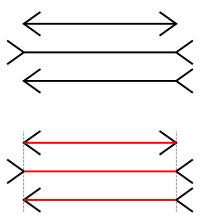 They have used Müller-Lyer illusion as an example. Diachronic penetration contrasts with the synchronic penetration of those input systems. Because subjects either (a) acquire some explicit theory (that has implications for their demonstratively illusory experience with some stimulus),6 or (b) gain wider perceptual experience including, possibly, wider experience with the illusion-inducing stimulus and, presumably, thereby obtain a new implicit conception of it,7 or (c) both, they would, in the case of synchronic penetration, instantly or at least very quickly cease to experience the illusion or, at any rate, experience a mitigated version of the illusion—e.g., the perceived disparity between the lines in the Müller-Lyer illusion (below) would measurably decrease. 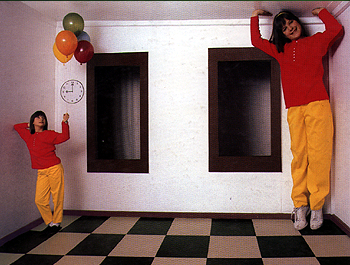 the Müller-Lyer illusion is a persistent illusion, Fodor (1983) also cites the Ames room and the phi phenomenom (perceiving a series of still images, when viewed in rapid succession, as continuous motion) as persistent illusions. It appears that the simultaneous contrast illusion is a persistent illusions. The simultaneous contrast illusion is induced by the distribution of the peripheral gray values which indeed show a continuous shift of gray levels, although in a reverse direction. The phenomenon of simultaneous contrast helps us to make the contrast clearer; helping us to identify figure-ground relations more easily, more quickly and more securely (Carbon, 2014). Visual processing is very fast, it generally starts at about 75-80 ms (Vanrullen & Thorpe, 2001). There are some illusions that once they are 'figured out' wont work again (such as change blindness). Some illuisons require sematic knowledge to fill in the gaps for example the illusion below. What we will perceive at first glance is mainly guided through the specific activation of our semantic network. 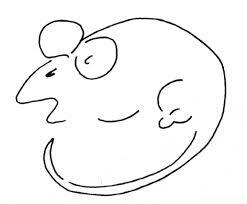 If we have been exposed to a picture of a man before, or if we think of a man or have heard the word “man”, the chance is strongly increased that our perceptual system interprets the ambiguous pattern towards a depiction of a man—if the prior experiences were more associated with a rat, a mouse or another animal of such a kind, we will, in contrast, tend to interpret the ambiguous pattern more as a rat (Carbon, 2014). At first glance you perceive the illusion as one thing but you may go onto to perceive both things. This would require more time - and this would be the illusion changing over time. What I've concluded about the simultaneous contrast illusion and others like it is that perception of them is two things - fast and persistant. What I've drawn from this is that they don't change over time, and that not many researchers are interested in whether or not they change over time, possibly due to coming to the same conclusion? McCauley, R. N., & Henrich, J. (2006). Susceptibility to the Müller-Lyer illusion, theory-neutral observation, and the diachronic penetrability of the visual input system. Philosophical Psychology, 19(1), 79-101. Carbon, C. C. (2014). Understanding human perception by human-made illusions. Frontiers in human neuroscience, 8, 566. Vanrullen, R., & Thorpe, S. J. (2001). The time course of visual processing: from early perception to decision-making. Journal of cognitive neuroscience, 13(4), 454-461. I don't have an answer, but I do have a potential starting point to offer. I think the answer will depend on how/whether adaptation changes per luminance level. It might be the case that brighter surfaces lead to more visual adaptation. Or it might be that adaptation depends on perceived and not only presented luminance. Or it might be that the contrast itself is the thing the visual system adapts to (again, physical or perceived). Hopefully you can find more from this point on. Stuart Anstis has done more work on the topic since that paper. If I understand the question correctly, you are asking about the perceived intensity of a stimulus, depending on time of its display. I would suggest you look for literature which discusses temporal summation. In non-psychological tongue it's called Bloch's Law (Response=Intensity*time of display). Not the answer you're looking for? Browse other questions tagged cognitive-psychology perception vision or ask your own question. Is the Rubin Vase illusion an example of inattentional blindness?